David is a long time pot dealer – no wife, no kids, no responsibilities, nothing. Rose is an exotic dancer, not keeping up with trends in the trade. They come together when David has to create a fake family to help him smuggle drugs from Mexico into the US. It’s not something either of them wants to do, but neither has much choice. They recruit teenage Kenny who lives in their building, and Casey who is living rough to complete their family. They become The Millers and go on a hair raising journey involving Mexican drug lords, double-crossers, and an out of work narcotics cop and his family. Four individuals eventually become a unit to fight for their lives, but ultimately it is also to make their lives less empty. This is one of those ‘adventure rom coms’ on the shelves like Hit and Run and One for the Money. They predominantly revolve around something illegal, and involve romance between the two major protagonists – sometimes the romance is seen as a side issue, but ultimately it’s the main driver. We’re the Millers is a riot. There is obviously some image problems with Jen and her stripping, but aside from that, the dialogue is fast and entertaining. The casting is superb and everyone is extremely well suited to their characters. I particularly love Kathryn Hahn as Edie – she’s definitely the most comedic in this film (see her in Our Idiot Brother, Wanderlust, How do you Know, and Win a Date with Tad Hamilton). There is one especially funny scene involving a game of Pictionary that had us really laughing. More funny scenes follow, getting you to the end of the flick without any boring moments. I really enjoyed this film and would watch it again no trouble at all. It’s not overly clever, but it’s definitely funny, and I think it’s one of the best rom coms in 2013. Manhattan couple, Linda and George, are suddenly down on their luck after buying their first apartment. They have to sell up and leave the Big Apple, moving to George’s hideous brother’s place in Atlanta. Along the way they accidentally come across Elysium – a commune, no, intentional community. This seems to be a much better option than being unemployed in New York, or George working for his brother. So they decide to stay. George embraces the hippy lifestyle first. But after a while, Linda wants to stay and George starts to become skeptical. Their marriage threatens to fall apart as they try to discover what it is in life that makes them happy. Paul Rudd is one of my favourite actors. He’s always the good guy in rom coms and he’s usually pretty funny. He didn’t disappoint me in this flick and I really like him coupled with Jen. There were some over the top stereotypes (as usual) with the intentional community, but none that make you cringe. This movie is light and funny, has good romantic content, some important messages about money and what can make you happy, and can easily be watched again. I very much enjoyed it and had a good laugh. Sue (Aniston) meets Mike (Zahn) on a business trip while she is staying at his parents’ hotel where he is the night manager. He pursues her in the most awkward fashion – in fact sometimes the scenes are more cringy than funny. Mike follows Sue around in the hope she’ll fall in love with him, despite the fact that she is engaged to the oh so cool Jango (Harrelson). 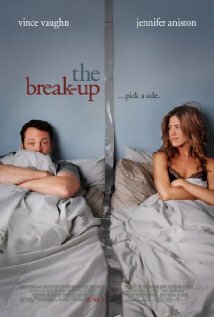 This film reminded me a bit of The Good Girl where Aniston plays a check-out chick in a small town. She does a good job in this flick, but there is a particularly ugly sweater that should never have made it to the big screen! It’s not a great film, not too bad, but probably wouldn’t overly recommend it. Butler plays an ex-cop-turned bounty hunter who is assigned to bring in his ex-wife who has skipped bail on an incidental charge. Aniston, a journalist who is working on a story, is hot on a case involving drugs, murder, and dirty cops. They both get embroiled in the case, hating each other at first, but eventually having to work together. I hated this movie the first time around. I was unduly influenced by my neighbour and friend, Cassi, who saw it first and didn’t like it. (She is not an Aniston fan, whereas I am.) I was ready for a cracker and this film is certainly no cracker. But it is a bit better the second time around. Of course it’s the usual ‘boy gets the girl’ type movie and ends happily with a big smooch. But there are a few adventures along the way to keep the viewer fairly well entertained. Jen’s tan is far too much, and I really don’t like the tight black number she is wearing for a lot of the film. But aside from Jen criticisms, the film is light, has some action, some laughs, and some romance.